You've got bookmarks for websites you need to check daily and frequently used online tools; news alerts for tracking your nonprofit's keywords and issues; email; social networks; RSS feeds for favorite blogs…It's all too easy for a busy nonprofit worker to miss vital information, or to waste a great deal of time checking for updates through the day. Now imagine one customized website that can aggregate it all. One site where you can organize all those tools, track news and social media mentions of topics of interest, and see all your monitoring data at a glance – a personal dashboard that's updated in real time. A personal dashboard set as the start page for your web browser can go a long way to making your work day more productive. So far so good... but if you’re like me, you’ve never found a personalized start page that really suited – and that you still have a whole bunch of other sites you need to check daily, just to keep on top of the news around your nonprofit’s area of concern, not to mention your progress with online outreach and reputation management! 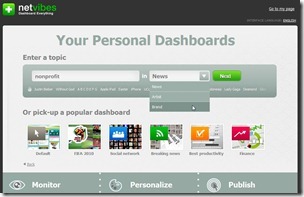 This week, Netvibes pulled way out ahead of the start-page pack with its new smart “dashboard engine” -- part search engine, part RSS feedreader, part personalized home page, part social networking interface, part real-time Web monitoring tool. You can even create a slick-looking public page for your nonprofit and its mission – a page that updates itself automatically as the news comes out! The searchable library of widgets, to add with one click, allows for easy customization to give you the right monitoring tools to deliver the (real time) information that’s most important to your nonprofit. 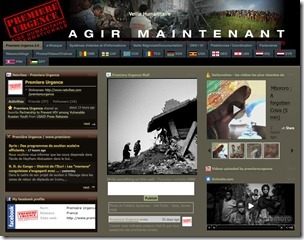 Many of the widgets are third-party provided, of course, so they’re also available for iGoogle and similar start pages. Where Netvibes has the real edge is that it enables anyone – with or without tech skills – monitor the real-time Web with topic-tracking dashboards that take just seconds to get up and running. You can create a monitoring dashboard on any topic – your organization or keywords related to your nonprofit’s mission, or the name of the organization itself – in literally the same time it takes to enter keywords into a search engine and hit Enter. But instead of sifting through pages of search results spread across time, you’ve got real-time reports delivered to your dashboard – one interface, no waiting. No more missing the important time-sensitive stuff you need to act on right now. Dashboard Everything …We’ve organized more than 100 of the best tools out there for helping you get started monitoring, listening and analyzing the real-time Web. Monitoring tools like customized Google News search and Digg widgets help you track and keep up to date on topics that matter to you. Listening tools like Social Mention and Trendrr help you discover and follow trending topics. Analyzing tools like Twitter Sentiment and Compete Analytics help you dig even deeper by analyzing reputations and trend charts. The default setups will be perfectly fine for most purposes, so you can instantly create a monitoring dashboard for any topic of interest – tracking online mentions of your nonprofit’s current campaign, perhaps – then delete them just as quickly when they’re no longer needed. And there’s no limit to the number of dashboards you can set up for your own private use, or the public pages you can create to share your version of the news! Take the new Netvibes “instant dashboards” out for a quick spin – 10 minutes of tinkering around will give you get a good sense of how it all works, and how well it might work for your organization. If you’ve created a public Netvibes page that could give ideas to other nonprofits, please leave a comment to let us all know about it! Great tip on the LinkedIn Answers feed, Blase - answering people's questions is one of the best ways to get visibility and build credibility, and something nonprofits might want to look more closely at doing... if they find a group closely matches their mission, of course. Thanks, too, for the link for Digital Marketer's podcast about RSS Feeds: I'd missed that completely. And it's well worth sharing - especially since there's text for those who can't or prefer not to get info by audio. Gotta like that. Hey, two winning tips in one comment - good work there, Blase! We use Hootsuite for our social media dashboard.. It's Fabulous. We have also made our own real-time local map within our Wild Apricot Powered Website: http://www.PeninsulaShops.com/realtimemap2.